After The Hurricane – The Messy Middle • Run Hard. Rest Well. The evening news is strangely quiet about the monumental hurricane relief effort underway in the south, as well as the Caribbean Islands. The tragedy of the hurricane damage is now old news. Sadly, there are new tragedies for the news teams to spotlight. The TV coverage is over, but the heartache and loss of broken lives continues, and often multiplies. As God’s people, where are we now? When tragedy strikes, people rise up. We act. Give. Support. But then – hours turn into days, and weeks turn into months and years. Many of us live far away. What are we to do? What ARE we to do? Listen, obey, act. Don’t hesitate, neglect, or detour. Then – live free of guilt. Avoid “survivors’ guilt” – which can be real and life-draining. We cannot do everything, but we can do something. The Holy Spirit will lead the way, but we need to ask. His answer may be GO or Do, STAY and PRAY. or it might be WAIT – wait for YOUR marching orders. Who has God laid on your heart? Known friends or unknown strangers who have lost everything? A neighbor who lost her mother? A friend who lost his job? 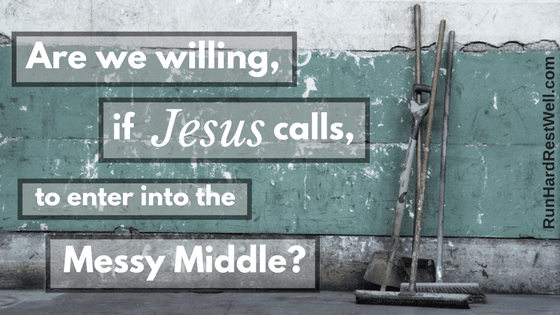 Are we willing, if Jesus calls, to enter into the Messy Middle? So many wounded, broken people feel forgotten as days turn into weeks, months, and years. Being REMEMBERED, moves mountains. It validates our ache and loss. It reminds us that we are not alone. As you ASK Jesus and LISTEN well, be open. He may surprise you with what He wants you to do. Write a letter. Write more than one. Provide financial support over the long haul. Be the hands and feet of Jesus. For some it means walking across the street. For others, it means driving through four states. If Jesus says go, GO. Pray . . . like really, really pray. Start a care campaign. Set into motion your family or your church ADOPTING a family, a church or a community in need and creatively “remembering” the people of that place. Thank you for this reminder!! Beautiful! God bless you for your ministry!! Marsha, Thank you for the encouragement. Run Hard. Rest Well. is passionate about the race we run and the rest that refuels. “Remembering” people is a beautiful way to remind them that they are not alone. You just remembered me, and it means a lot. May our hearts listen well. Absolutely! Just a note, text, call, or email reminds those who are lost among the devastation need the reminders they are not alone. How a simple gesture can mean so much….moving their focus from the “impossible” job before them to Jesus….to the co-laborers beside them. We all need that…..even those who are just overwhelmed by life. How do we know who to reach out to? Keeping our eyes open and our hearts open to the Holy Spirit’s prompts.